The insurance company adjuster wants to take my statement? What should I do ? Proceed with caution question !!! Question: “I was involved in motor vehicle accident on February 1, 2018, while driving my vehicle on Jefferson Blvd. in Oak Cliff, Dallas Texas. I was making a left turn with the protected arrow when the other driver ran a red light and T-boned the passenger side of my vehicle. I was transported to ambulance to Parkland Hospital with serious injuries. I was not able talk to the police officer at the scene since I was transported to the hospital via ambulance. After I reviewed the police report weeks later, I find out for the first time that the other driver is saying I ran the red light. The other driver’s insurance company wants to take my recorded statement. What should I do?” John____. I do not recommend that you give recorded statement without talking to attorney first. 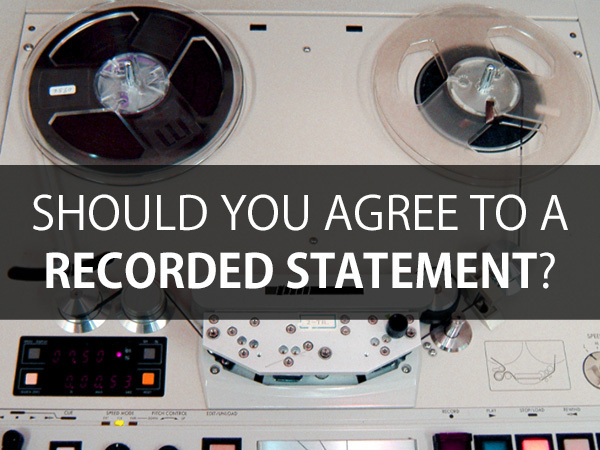 A recorded statement can be used against you by the insurance adjuster as long as you give consent to the recording. An insurance company adjuster is well-trained regarding what questions to ask regarding liability and your damages. Specifically, the insurance adjuster will probably ask questions regarding time, distance, and speed of your vehicle and their insured who ran the red light. Even if you have witnesses who support your claim that you had a protected green arrow, an insurance adjuster can place partial blame on your shoulders if you had an opportunity to avoid the impact. Unfortunately, in Texas, if the adjuster believes that you are 10% at fault because you were not maintaining a proper lookout, then the adjuster will reduce your damages (your claim for medical bills, mental anguish, pain and suffering etc.) by 10%. If the adjuster believes that you are more at fault than there insured, they can even deny your claim based on the statements you made in the recorded statement. In that situation you would have no choice but to retain a lawyer. Tragically, there have been some cases where a injured party is not able to retain an attorney after giving a unprepared recorded statement. The reason for this is that an attorney uses a contingency fee contract for most personal injury cases in Texas. Although this is a great contract for the injured in Texas because they do not have to pay the lawyer upfront, with this kind of contract many lawyers cannot help every client if there is not a reasonable likelihood of recovery. Do not give recorded statement without talking to a competent attorney who is experienced in personal injury trial law. I’ve been a lawyer for over 30 years. I am board certified in personal injury trial law and civil law. My principal office is in Fort Worth located at 312 Harwood Rd, Bedford, TX 76021. I also have an office in Oak Cliff, Dallas Texas and I will visit with my clients with an appointment at this location. Remember, your first appointment is free.